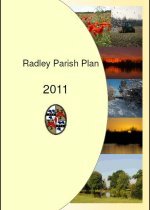 Following several years’ hard work, the Radley Parish Plan was launched at a well-attended event in Radley Village Hall on Sunday 23 October. The Plan is a 20-page document illustrated with colour photographs from around the village. It provides an overview of Radley today and sets out how residents wish to see the village develop in the future. 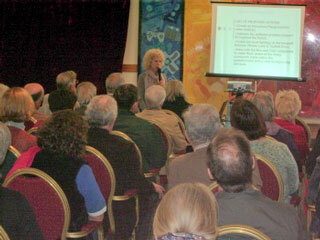 to a packed village hall on 23 October 2011. Kayla Tomlinson, chair of the Parish Plan Steering Committee, introduced the Plan explaining that it was the result of a lot of research and consultation, with much of the Plan being based on the responses to a questionnaire delivered to all households in Radley in February 2011. The Steering Committee had also talked to local organisations and people, asked people what they most ‘liked’ and ‘hated’ about Radley, had stalls at village events and organised visits to Radley College and the two remaining working farms in the village. Just over half the questionnaires were returned – a very good return rate for a survey of this kind. The list of the questions with the responses is given at the end of the Plan. Eric Davies, another member of the Steering Committee, picked out some of the interesting results. The responses indicated a vibrant community with a relatively mature population (almost half were over 60). More than 70% of those who filled in the questionnaire had lived in Radley for more than ten years, with just under half having been here for more than 20. Radley was considered a safe place by the majority of people, even after dark. Potholes attracted much attention, with pavements and speeding also highlighted as problem areas. Over 90% wanted to see the Green Belt preserved and 60% wanted Radley to stay the same size. There was strong support for the option of continuing to renovate the Village Hall rather than a rebuilding it or moving to a new site. Three quarters of respondents had access to the internet but only about half were satisfied with the speed (they weren’t asked if they used the village website!). The Plan concludes with a list of 19 proposed actions for which there seemed to be a consensus. These were outlined by Kayla Tomlinson, who pointed out that some would be relatively easy to implement and some would not. Some require action by the Parish Council and others require action by the County Council, the police, transport providers, etc. A printed copy of the Plan will be given to all village organisations and groups. Copies will also be sent to the Vale of the White Horse District Council and Oxfordshire County Council. Following the presentation everyone was invited to enjoy a piece of the Parish Plan cake with a cup of tea or a glass of wine. There was also a chance to look at the Plan’s pages displayed on boards down the side of the hall. Copies of the plan can be downloaded from the Parish Plan page on this website.